It's been an eventful few months for Qualcomm – back in December the company had unveiled the first reference designs of the Snapdragon 855 and demonstrated integration with the 5G X50 modem. It’s easy to forget that the X50 modem has had quite of a long time to market, as we had first reported on the chipset way back in October 2016. One of the bigger draw-backs of the X50 modem was the fact that it was a 5G only modem – meaning it only had support for 5G NR communication standards, and it had to be paired with the modem inside the Snapdragon 855 in order to offer full network compatibility. This resulted in some awkward solutions such as the Moto 5G Mod, which to say doesn’t represent the most elegant implementation from an engineering stand-point. 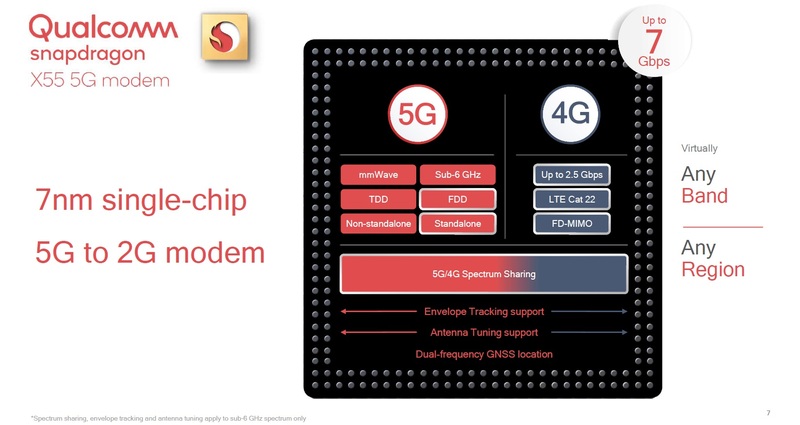 Today Qualcomm looks to address this major concern with the announcement of the new second-generation X55 modem: A full standalone multi-mode modem solution. 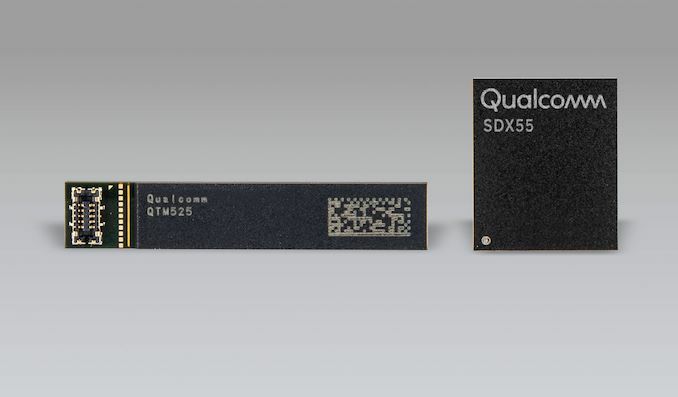 The X55 differs from the X50 in that it supports all communication standards, from 2G, 3G, 4G to the newest 5G standards, no longer requiring the chip to work in combination with a Snapdragon SoC modem. The modem’s 4G capability has also been improved, offering UE LTE Category 22 speeds of up to 2.5Gbps via 8xCA at 256QAM. What is actually one of the most important aspects of the new X55 modem is the fact that it’s Qualcomm’s first true global 5G modem. In 5G mmWave, the industry has largely consolidated around three frequency bands: 26, 28 and 39GHz. The 26 and 28GHz are the first pioneer bands that will be implemented by carriers in the next few years. The problem with the first generation X50 modem is that it only supported the 28GHz and 39GHz bands which are predominantly going to be supported in markets such as North America. 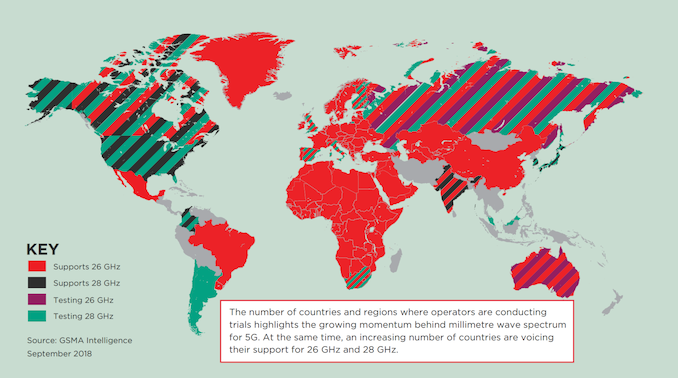 The addition of the 26GHz band in the new X55 vastly opens up other potential markets in other continents where there’s more plans for deployment with frequency spectrum starting at a lower 24.5GHz. Another very important change in the X55 modem is the fact that it now supports 5G NR sub-6GHz in FDD mode. Previously, the X50 only supported TDD frequency bands. While again this might be fine in the first iterations and carrier deployments, lower frequency spectrum at and below 800MHz is only available in FDD duplex mode. 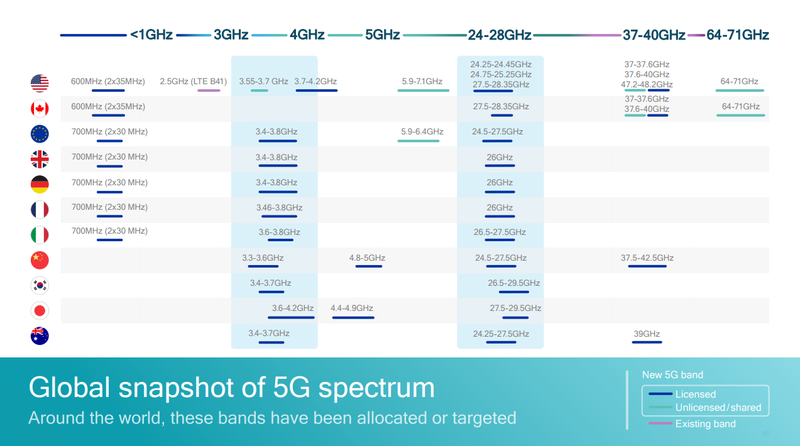 It’s extremely crucial to be able to support these lower frequency bands as they give the best range and penetration, and as over the next few years carriers will migrate spectrum to 5G NR, supporting FDD bands will give X55 modem devices much longer longevity and future-proofing. It’s to be noted that the X55 also now supports spectrum sharing, meaning 5G and 4G can co-exist on the same frequencies. The new modem is manufactured on a 7nm process node, although Qualcomm woudn't confirm if this means the existing TSMC 7nm node or Samsung's new 7LPP EUV node. Naturally to be able to support the new 26GHz frequency band, Qualcomm had to also update the RF components. Joining the X55 modem is the new QTM525 mmWave antenna module, succeeding last year’s QTM052. The new module further improves its form-factor by becoming even narrower than the QTM052: Qualcomm promises it will enable sub-8mm thick phone designs. In terms of spectrum capability, the new module maintains the same 2x2 MIMO 800MHz bandwidth as the QTM052, reaching mmWave band speeds of up to 6Gbps. Qualcomm is able to advertise 7Gbps by aggregating with sub-6GHz bands on LTE. Revealed today is also the announcement of two new accompanying RF solutions: The new QET6100 envelope tracker and the new QAT3555 antenna impedance tuner. 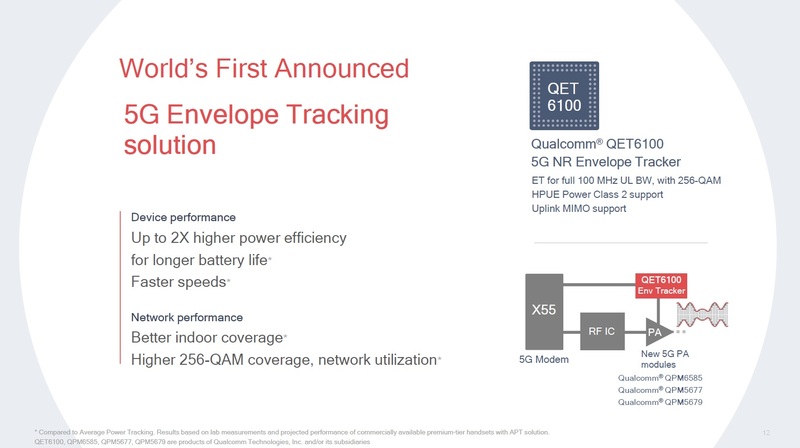 The QET6100 isn’t the first 5G ET solution (ET is also available on the X50 and competing solutions), however Qualcomm is able to claim it’s the first to support 100MHz upload spectrum, while its predecessor was only able to support 40MHz. As carriers allow for wider frequency bands, this will be a crucial addition that will improve battery life of devices. 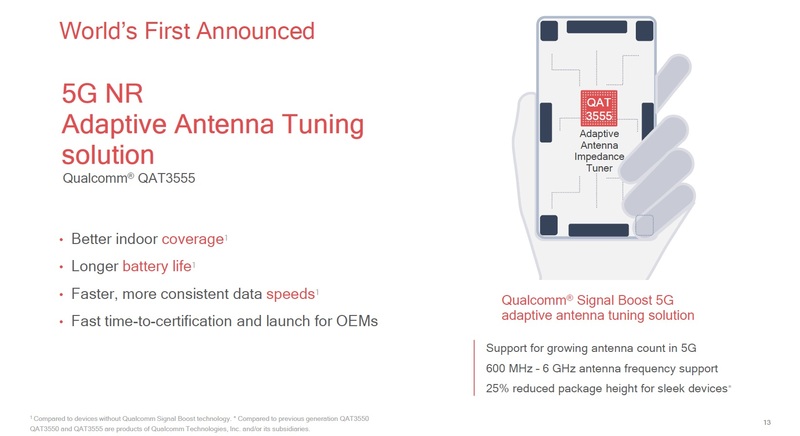 The QAT3555 enables better antenna impedance tuning with the multitude of antennas expected to be employed in 5G devices. Antenna impedance tuning is able to avoid reception issues when users hold their device in certain ways- this was popularly referred to as “death grip” several years back. Overall, the X55 modem is I think a much more future-proof and elegant solution than what we’ve seen presented in the X50. The X50’s band and mode limitations inherently mean it will only garner limited support by some devices in certain markets. The X55 seems to be truly global in its capabilities, and most importantly also offers a full all-in-one solution meaning we could see the modem paired with non-Qualcomm SoCs/CPUs. Qualcomm expects the first commercial devices with the X55 modem to come towards the latter half of 2019. So they're likely to have an updated Snapdragon to support that? Seems weird if in H2 2019 the discrete solution has a wider range of support but the flagship SD didn't have it. To me, it makes a lot of sense at this time of the product cycle. By having it separate they improve the yield for their flagship SoCs (no chance of a defect in a portion that isn't there); and if you don't need 5G you don't have to pay for it. And if they do, Qualcomm gets to sell another chip! I'm not certain, but I think it may have just to do with the added complexity of needing extra components to serve two frequency ranges needed by FDD. For mmWave TDD requires much less complexity.